Does the word “advertisement,” the one that defines and controls our Western culture, the one that causes our economy to flourish, that encourages excessive spending and, ultimately, pain and suffering – is that the same word as the Middle French origins of “avertissement”? Warning = ad, in other words? Webster’s says it is so. Ergo, the advertisers aren’t really lying when they call it advertising; their approach is, in other words, one of full disclosure – but because we are ignorant, we are the ones to blame for not knowing the origin of the word. Or have they somehow distorted the concept, turning an announcement of bad tidings (the root of its meaning) into one of neutral content, or even, good news? Rather like propaganda. I find it ironic that a word can alter its meaning, or interpretation, like that. I know it happens in slang – a pejorative can become a compliment, such as in “That was sick!” meaning, “That was so great!” and thus inverting its description. I don’t think that that is what is going on with this word, advertisement – more likely, it has been undermined and distorted. Turned from a negative to a positive. The funny thing is, though, that it hasn’t at all been altered, in the sense that ads should be read as warnings instead of enticements. How did this happen? Do the French know way more than we do because they understand the meaning of the word? Do they filter ads based on this root of warning? Are they less likely to be sucked in by advertisers? Every ad should be a warning to viewers or listeners, it should be suspect rather than accepted as something specific to you, paid for by a business to help you solve all your problems, magically! It’s the same old snake oil in a different container, a smelly rose by any other name, etc. Well, if you start to examine advertising, get beyond the glitz, the showmanship, the humor, the entertainment value, the shouting and hammering over the head with repetitive slogans – you will see it for what it really is: avertissement. Danger, Will Robinson! Back to the sun visor. So, here is a pairing of words from two different cultures that has made me, enveloped in this one typically isolated culture, understand something about it. To examine, simply, a word. But to examine the greater issue of one of the driving forces of this culture, its raison d’etre (French, again) and the origins of its meaning. And, hopefully, now, a greater meaning and understanding of what it is about. It is frightening to think about the pervasiveness of this one word in our culture, the power that it wields, and ultimately, to the world, a definer of us. And, amazingly, its denotation is cautionary. I don’t know about you, but I find that kind of horrifyingly off-putting. That the American public is constantly fooled by something that, at its root, is a straightforward warning. It is kind of mind-boggling. The word has transparency, it is there as an obvious connection (suddenly for me) and yet, millions of people are systematically “taken in” and fooled by it on a daily basis. 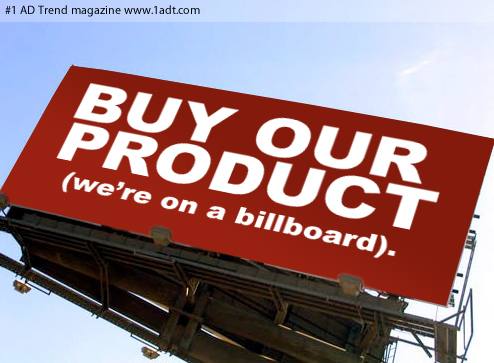 Everything in our culture is affected by advertising (avertissement! ), its smarmy underpinnings having infiltrated every aspect of society. The really scary thing is that it has laid the groundwork for our messed-up political system, a frighteningly similar arena for misunderstanding and foolery and advertisement. 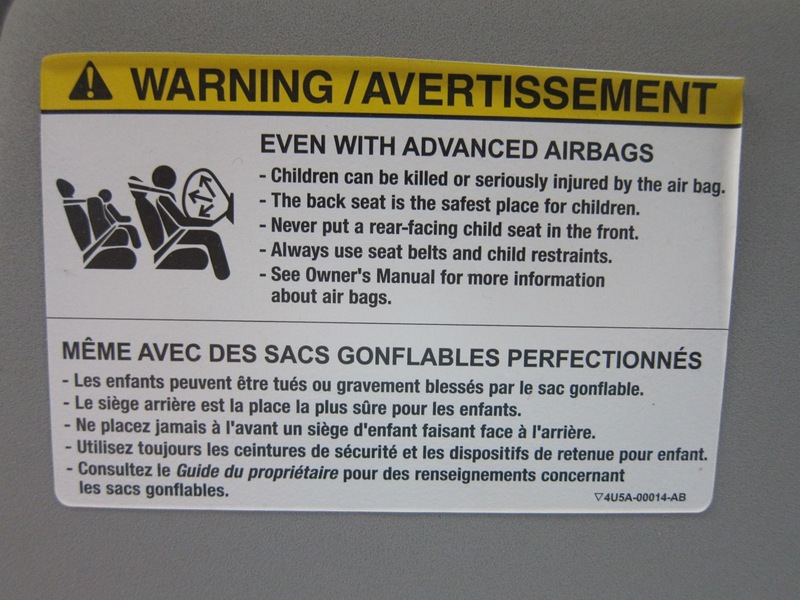 How can a warning become a way of life, and a perversion and demise of that very life? Every American should have that sign on their sun visor because, perhaps, it will help them to see more clearly instead of just deflecting the light. A pairing of words, potentially the placeness of a definition. In a car, no less. Arslocii – this blog, the eponymous website, the concept itself – is, as we point out often, about pairings and duality, conjoined opposites combined in mutual impact, yin and yang, this and not this. 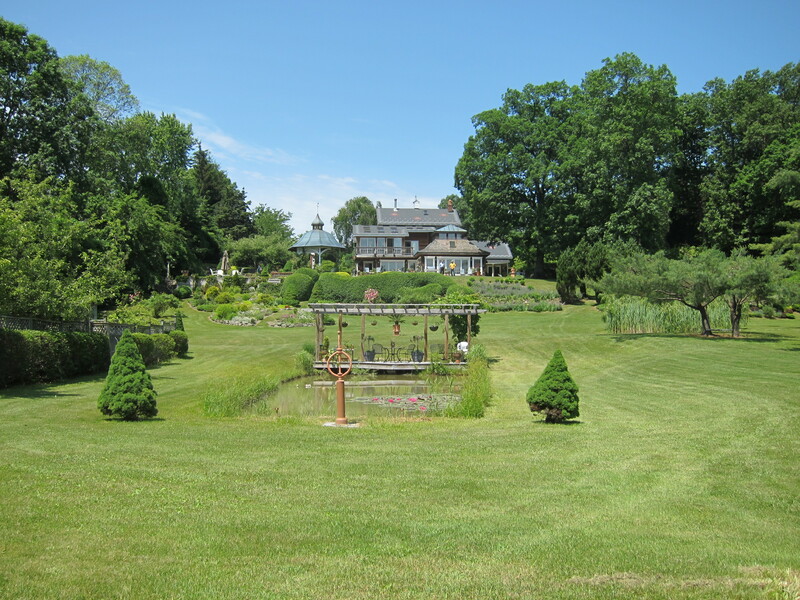 Last installment, in writing about two quite different gardens, we discussed dominance over vs. partnership with the land, and light/dark, or sun/shadows. With a little more time for reflection, we realize that we overlooked one important duo of elements that, frankly, lie at the heart of nearly every arslocii, not always but often acting as the key to the appreciation of the wedded art and site, not always but often the catalyst for drawing our attention to something special – bringing us into the tent, so to speak. And that element is – surprise! – surprise, or, rather, the combo of expectation and surprise. This pairing – like the two terminals of a highly charged battery – is what gives us the jolt that causes us to be swept up by, say, a movie or play that we’ve been dragged to see against our better judgment, or by a book that we’ve had recommended to us but which we’ve avoided sinking into, or by a work of fine art that we believe is painfully outside our usual comfort zone … or even by a person who seems so unlikely to be someone we could be even remotely interested in – until we realize, recognize, that this is The One. Low expectations/high surprise, leading to the discovery of something new in the world that speaks to something deep within us –the shock of the new that makes contact with the shock of essential recognition. The assumption shattered by the out-of-left-field revelation, or challenge, or empathetic response. A contribution to placeness, and arslocii. 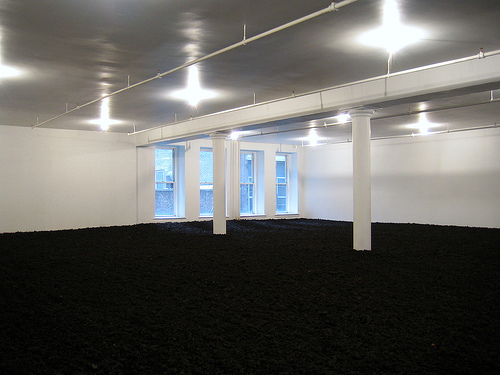 We think back on some of our intersections with arslocii subjects, and surprise-over-expectation is nearly always an aspect contributing to our receptivity and to its unforgettable nature: climbing the stairs and turning the corner to see Walter De Maria’s Earth Room, expecting to view no more than some artsy, ‘70s, one-note gimmick of a New York City office space filled with dirt – but finding, instead, a shocking space of noble silence, referential beauty and, remarkably, emotion; turning another corner (not a necessary action, this corner-turning, but a frequently surprise-inducing one) and being awed by the power of presence of a hulking Richard Serra piece, indoors, an unlikely captive in an enclosed Dia:Beacon hallway, both squeezed by the space and expanding it, defining the multiple implications of the word “enthralled”; walking through a parking lot of a featureless apartment complex, trying to find, hidden there, what’s left of Andrew Jackson Downing’s and Calvert Vaux’s Springside, expecting nothing but the weak suggestion of a once grand estate shoved now out of sight and left to ruin, like an afterthought forced upon a begrudging community – only to discover a magical, ghostly spot, perhaps the most placeness-redolent place we have come across in our journeys. So – this visit to the mechanic. The garage and office reside in a low-slung building just outside the city limits on a twisty road that is home to various auto-service and -rental businesses, and other miscellaneous fringe enterprises. The garage/office “complex” is set to the back of a typically desolate, hard-surface stretch of cars and used-to-be cars, those being saved and those being cannibalized, accompanied by the sounds and smells and measured motion of any auto-repair shop – this one with a face towards the road and its back snuggled up against the high, craggy cliff-wall of a former quarry. Having left our no-longer-sturdy, ancient van to be “rejuvenated” there some days before, we returned to discuss a few things and to communicate a few fears and desires to the garage’s owners, a middle-age couple, both well versed in the workings of cars but the man the chief mechanic. 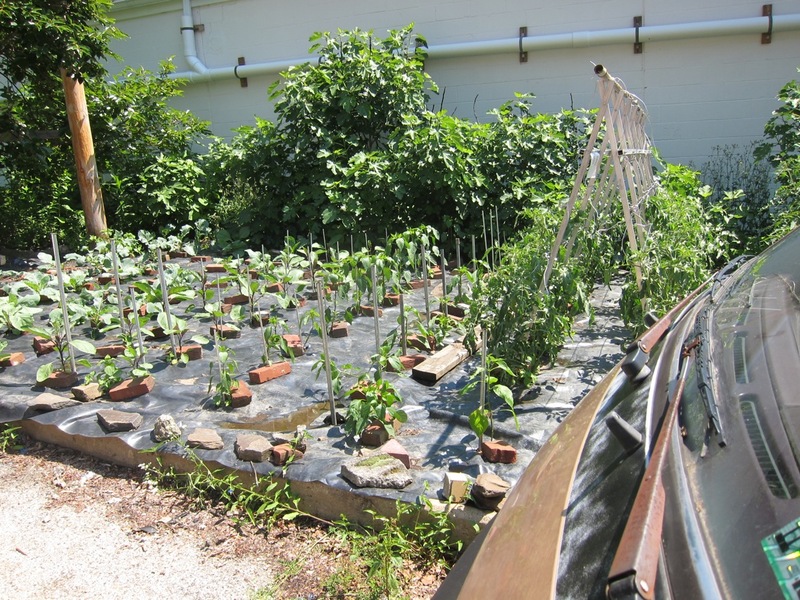 As we stood with him by the van, which was parked out in the car lot/boneyard, we noticed, in a large-ish nearby plot of land … a huge food garden, blanketed in protective black plastic and sprouting squash and peppers and tomatoes, basil and oregano and other herbs, and more – all this, adjacent to car carcasses and pools of oil and strewn auto parts. We expressed our amazement, to the mechanic’s obvious delight, and, in his thick, almost stereotypically theatrical foreign accent, he told us to follow him around behind the garage building – and, there, he gestured above him. On a rocky rise, against the stripped quarry wall, sat a structure, looking, at quick glance, for all the world like a Neutra or Irving Gill in the Hollywood hills, or like James Mason’s fantasy Modernist villa, pendent over Mount Rushmore, in North by Northwest. But this structure we were gazing up at was vague and diaphanous, and momentarily unprocessable, due to an expectation/surprise disconnect. 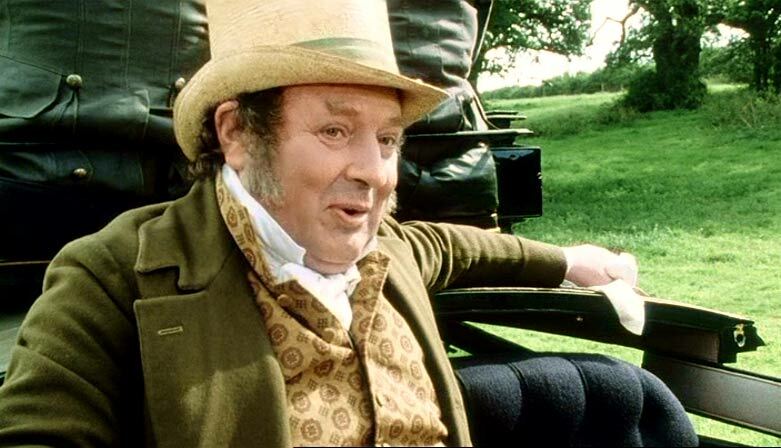 For there, looking down on the greasy ugliness of the shop and the busy byway beyond was, astonishingly, a sprawling, glittering greenhouse. The mechanic led the way, pointing out on our path the kiwi tree, and the persimmon, and the fig. 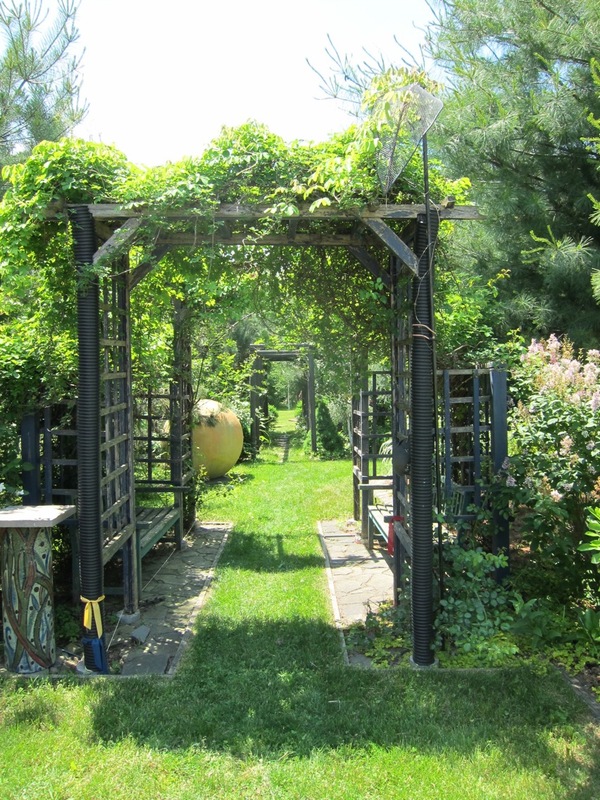 And, climbing up and into the greenhouse, he casually but proudly guided us around his Eden of blooming and ripening fruits and vegetables, and, among them, trees bearing lemons the size of grapefruit. So much vibrant and colorful life a wrench’s throw from a revving engine and the haze of exhaust. He gave us one of the lemons, and back home it was practically sufficient by itself to make a quart of lemonade. And it was delicious. Expectation – an auto repair shop. 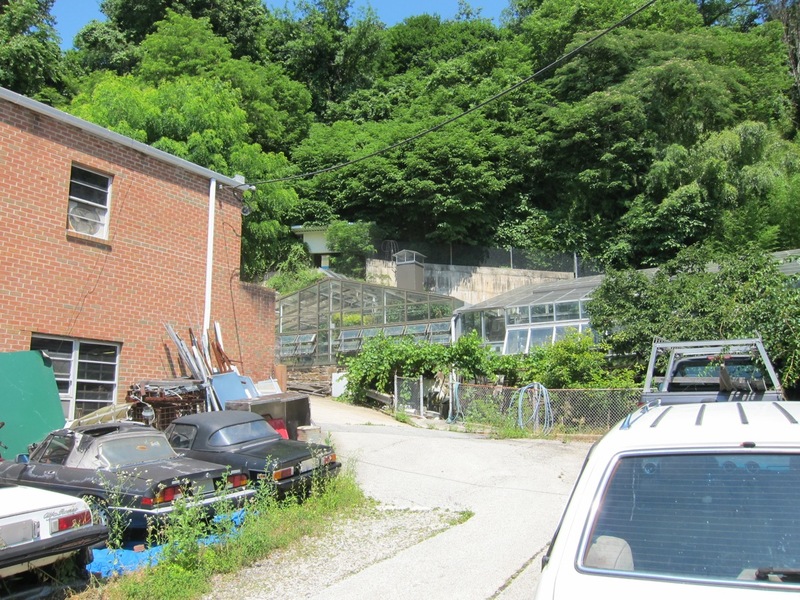 Surprise – a crystal cathedral between a garage and a cliff, burgeoning with food and life. And more – somehow, subconsciously, likely unintentionally, the mechanic had, in this alien terrain, collected up then deconstructed his Mediterranean world and recreated it, writ small, here. A work of personal art if we’d ever seen one, creating an arslocii full of biography and psychology, love and longing, and an assertion of placeness that not only defied and denied the distance from his homeland but reified the essence of it. For that moment, he shared with us his place, and wherever it was he wanted to be, we were there, too, full of wonder … and surprise. In our attempts to understand and explain the ins and outs of arslocii, we fell into a perfectly clear example during one weekend in June. It was one of those annual events in which people open their gardens to gawkers like us, for a small sum. This kind of thing echoes the class-based tradition of visiting large estates and stately homes in the United Kingdom, snooping while contributing to the upkeep of the digs of a long line of dukes and duchesses now on the skids. It isn’t quite the same here in the States, having no royalty, but there is a palpable sense of have-nots paying for the privilege of sniffing at the haves. 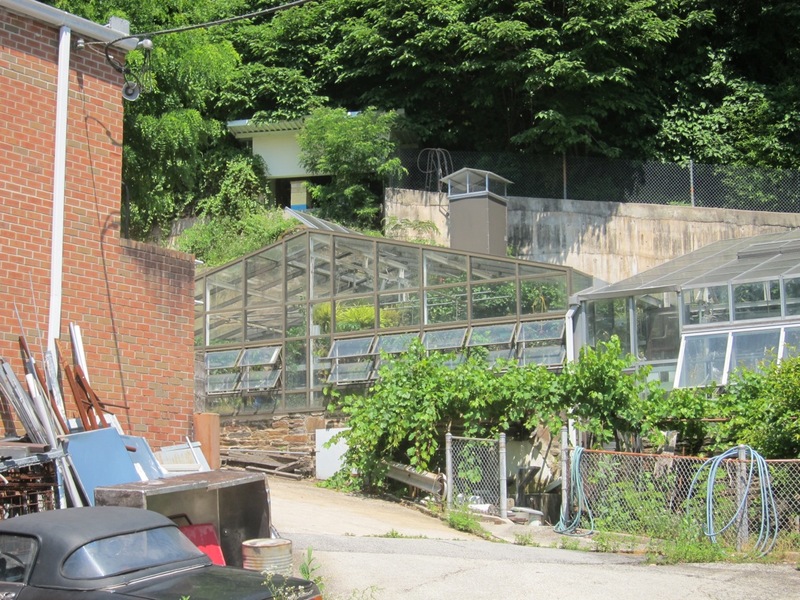 One garden in particular smelled of new money – an out-of-place McMansion sitting on a ski-slope-like bank on the west side of the Hudson River. The view, we admit, was breathtaking, but on closer examination, it was all wrong and not even attractive enough for the money ill-spent. 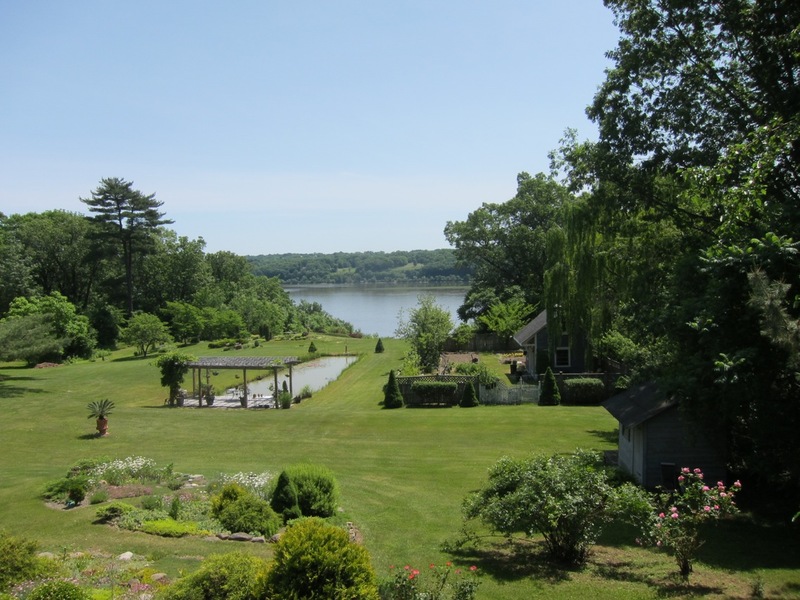 What had been done was a wholesale removal of a swath of forested growth, as wide as the property’s borders and all the way down from the hilltop manse to the water’s edge. We understand the desire to capture a view, but this was more like stuffing and mounting it. The fact is, there were opportunities aplenty to play peek-a-boo with the river, to tease and suggest by selectively removing or pruning trees. But, no, the owners (and that’s what they were – not guardian-dwellers, not loving cohabitants with the land, but simply owners) decided to just drop their drawers, so to speak, to make their vista a widescreen experience. So, now, rather than a naturalistic attempt at enticing with glimpses, there is a broad lawn tumbling down to the river (the thought of cutting the grass without ending up in the water is frightening, not to mention the erosion this causes), and it ends up resembling those channels cut into mountaintops to erect power lines, or a vertically challenging 16th hole on a golf course. Aside from the scalping, dotted about the steep slope are little islands of plantings, so out of scale and incidental-looking that you almost don’t notice them. They look more like footholds for descending/ascending the river bank than considered gardens. Well, we wouldn’t want any competition with the view, right? There is no sense of place in this scenario, since there is nothing interacting with the water view. Instead there is the shock, a feeling as if a flasher has his trench coat parted — and we all know how disappointing that can be. So, yes, these folks are rich enough to denude the land but they really have given nothing back to it, let alone done something in partnership with it. In contrast, there was another garden on this touring circuit with a less-than-ideal setting, but which was made into something special. A cluster of farm-industrial buildings of a strange Tudor design were situated right up against railroad tracks. We were told that this had been a cold-storage apple repository convenient to shipping – the land once part of a vast apple orchard production farm. To quote the owner and creator of the new incarnation of usage (as a costume factory) and gardens, “I am now eight years on from the weedy field of rubble I started out with. Sometimes I feel my intentions are starting to show, sometimes not … It’s at all times a workshop, a long dialogue with ‘Place,’ rather than the ‘design-and-install’ approach. Emphasis is of foliage, texture and contrast. Sculpture and plants are used in a theatrical context.” One of the strengths of this endeavor is the subduing of a large unwieldy space by creating rooms and transitions between them, each unique, each embellished with sculpture – the natural elements interplaying with the fabricated. In other words, there is a give with the take, a mutuality and not a dominance. And there is the wonderment of the garden not taking itself oh so seriously. It is a one-off site, and most people would not find the potential for beauty and magic in such a place. Enter the costume designer with a sense of style and whimsy to make it “sew” and you have a cohesive respite, a blending of fantasy and reality, a labor of creativity and craft with respect and a resulting air of joy. Placeness can be found here. And also shadows. Placeness, as we’ve shown in previous arslocii installments – and what is, in fact, at the very center of the arslocii definition – is much to do with duality and counterpoint. On our website (and you’ll pardon our quoting ourselves) we, in trying to wrap our minds around the arslocii concept, talk about “a special pairing of the manmade with nature, or sometimes even manmade with manmade; the effect being a symbiosis in which neither one stands out or alone, nor would be as meaningful, beautiful or inevitable without the other. It’s an interdependence of aesthetics that goes beyond, thankfully, human dominance over nature or setting, because that has never had much grace.” The pairings and contrapuntalisms – big/small, hard/soft, open/contained, inside/outside, close/distant – doled out in the proper amounts and with just the right tilt of the head are what create placeness, and what, in turn, can mix that placeness DNA with that of art. Add to that list another pair: light/dark. 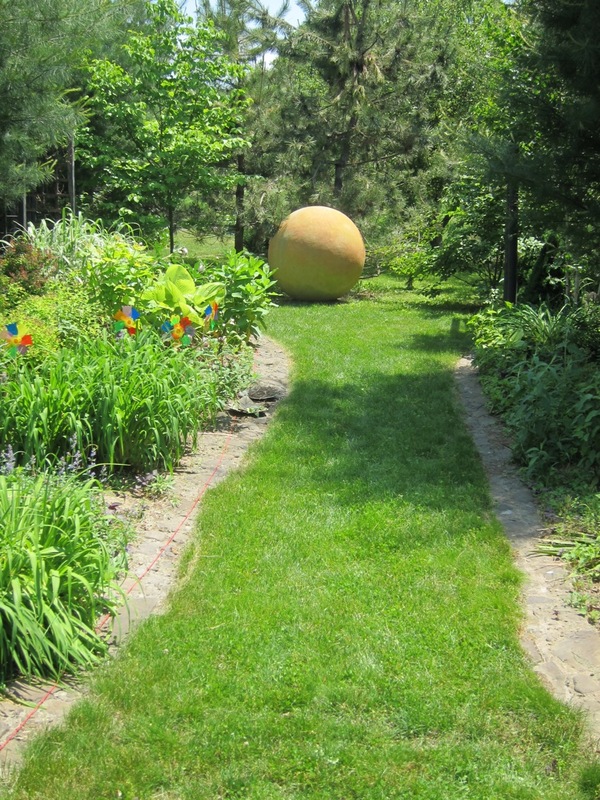 It is here where the two gardens, the subjects of this piece, show their true colors. In the first, there is no accessible shade or sheltered spot – it is all sun-bleached and, though lengthy, without depth. It is an overexposed photo – everything is lighted, and lighted the same way. And, thus, there are no revelations, no discovery – though green, and with a river, it is as much a desert as the Gobi. But the second garden – now, there, they understood that to see the light you need to have dark, and that the dark is only appealing (or nonthreatening) when one can see light. 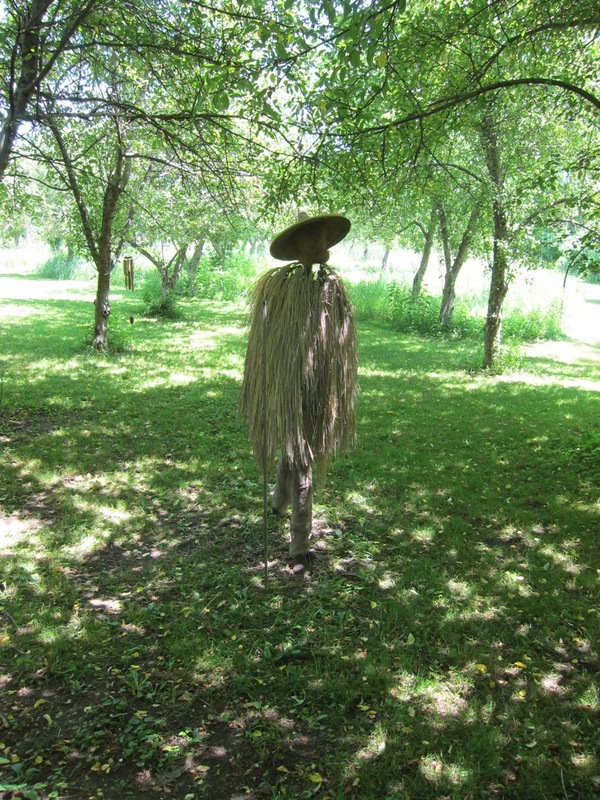 In this garden, one walks almost immediately from a light-drenched parking lot to the inviting shade offered by covered pathways and pergolas and way stations, then out again into an unprotected field adorned with small-ish sculptures … and then back again into the dappled shade of a woods – there to run into a straw man, a scarecrow, a figure that could be sinister but is rendered merely special by its location (there is no field of crops for it to keep birds from), by its lighting (only heavily filtered light, as opposed to the unremitting sun-soaked existence of most scarecrows) and by its backdrop: more light, and perhaps safety, just beyond. Back and forth, in and out, right here and up ahead. 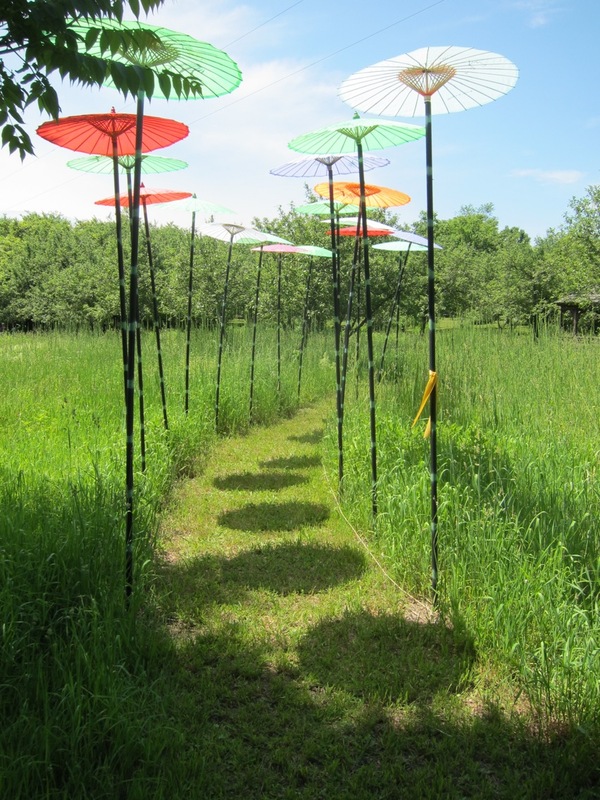 And then, just farther along one of the winding paths, an allee of colorful parasols that comment wonderfully on the duality: in the most direct sun, they cast tiny, mushroomy pools of shade along the trail, creating a dimensionality out of very little – not just periodic protuberances to dot a landscape, as in the first garden, but ethereal definers that provide senses: sense of location, sense of style, sense of humor, sense of intelligence … sense of place and placeness. Sense and sensual, but not (like the first garden) overly sensible. Artful, playful, resonant, basic, primitive, natural … arslocii. We humans like to mark events, to placemark something meaning-filled in our circular, and sometimes repetitive, lives, giving significance to moments along the continuum. Much as a dog “scents” his physical surroundings, bipeds have a need to mark their territory in a conceptual way by choosing a date and re-acknowledging it every year; literally re-turning. We call this an anniversary. These yearly events – whether birthday, death day, the founding of an institution, the reenactment of an historic celebration or battle, or a marriage ceremony – remind us and reinforce in us a feeling of continuity and specialness in an otherwise chaotic world. Four such anniversaries have converged this year and this month for arslocii. One is birth related, a second is relationship-based, a third is site-specific and the fourth concerns an institution’s creation. All are meaningful to us in different and yet similar ways: pairings that are related to and responsible for the raison d’etre and concept for this blog (for those astrologers amongst us, the fact that June is associated with the Twins, the constellation of Gemini, is an interesting coincidence although a loud “whoa” is not necessarily warranted here). We at arslocii are always trying to achieve perfect pairings, in an attempt to make connections between art and site. Over the year and a half that we have been writing here, we have explored many aspects of the concept, far more ideas than we originally could have fathomed. So here we go again. 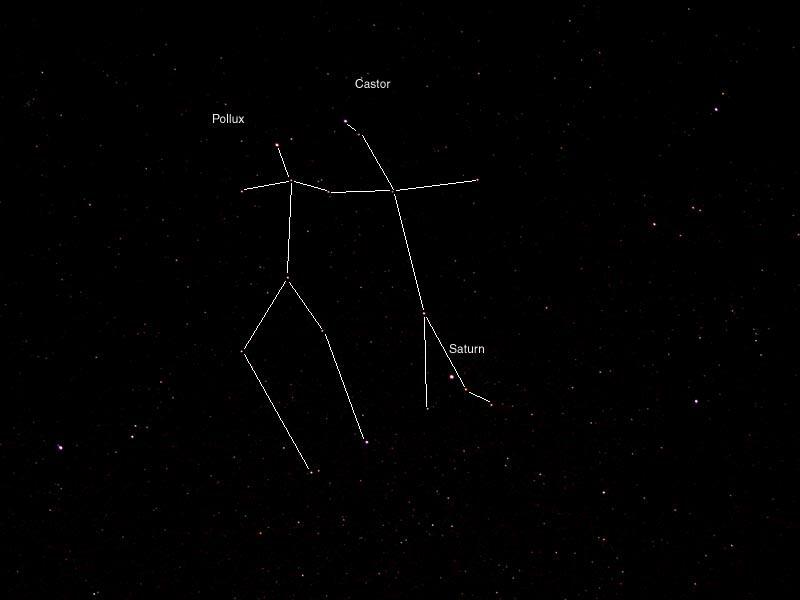 Quickly, the birthday anniversary this month (a nice round year) was observed in a lovely place that had an unearthly number of constellations visible – we know Castor and Pollux were in there somewhere – so that it couldn’t have had more placeness anywhere else. That is the first instance. 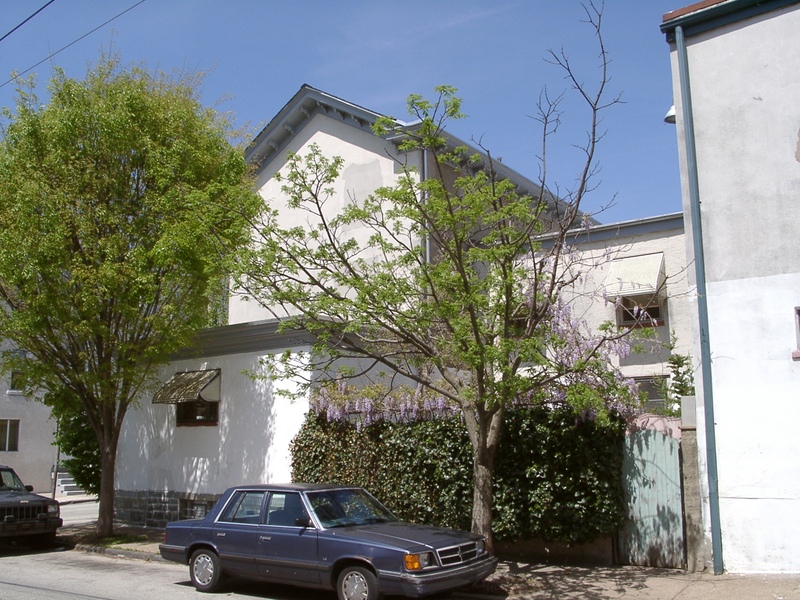 The third instance (if you are counting, I skipped the second) is that the home of arslocii, the shelter that keeps our writing paper dry and our bank accounts empty, was discovered and made ours exactly 25 years ago. This anniversary reminds us of the road traveled but, mostly, of the weighted anchor that home ownership is – both the associated successes and failures – and of what these walls could tell you in the quarter century that we have been holed-up in this, our version of the American Dream. It is our relationship to this behemoth structure and the life-altering interactions with it that have paired us in eternal DNA linkage, bone to mortar. 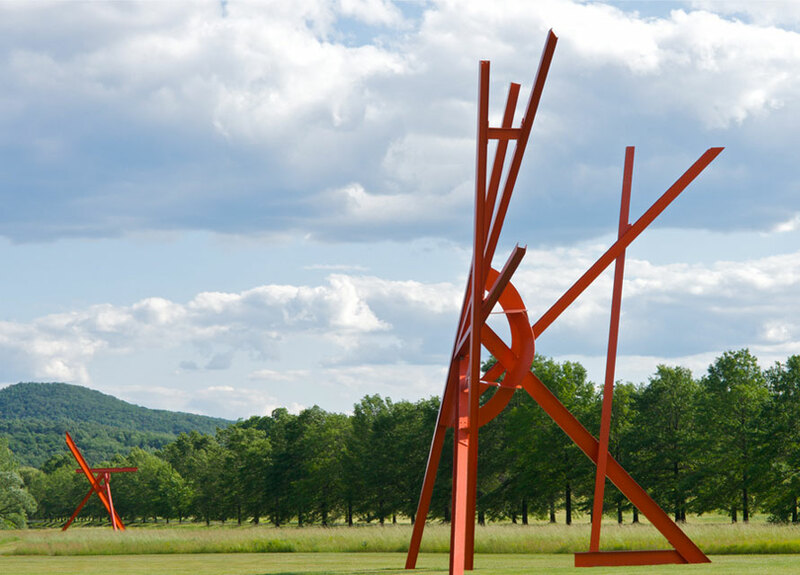 A fourth anniversary is a 50-year one, of the founding of Storm King Art Center. This may not appear to be a personal milestone but it is. Storm King, named for the mountain that presides over it, is the most excellent of sculpture parks. The park’s very existence, as well as its presentation, is the underlying inspiration for arslocii because it “gets it” about pairings. 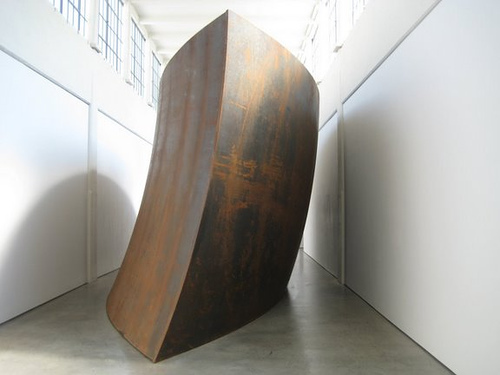 And it made us “get it,” too, because its original concept of matching sculpture and site is a definer for placeness. It has caused us to be put into a position of trying to explain the inexplicable. Storm King illustrates, so seemingly naturally, what we seek out. We realize that their result took incredible foresight and planning, not to mention vision, to achieve it. Its magic is in the way it looks as if it had happened spontaneously, as in a random toss of pick-up sticks or, perhaps, emerging as Athena full blown from the head of Zeus. The second and final anniversary (and these are not in any kind of hierarchical order) is the one that caused the most significant pairing – the meeting and marriage of the authors. On the very same date that they met, four years later, they were wed. 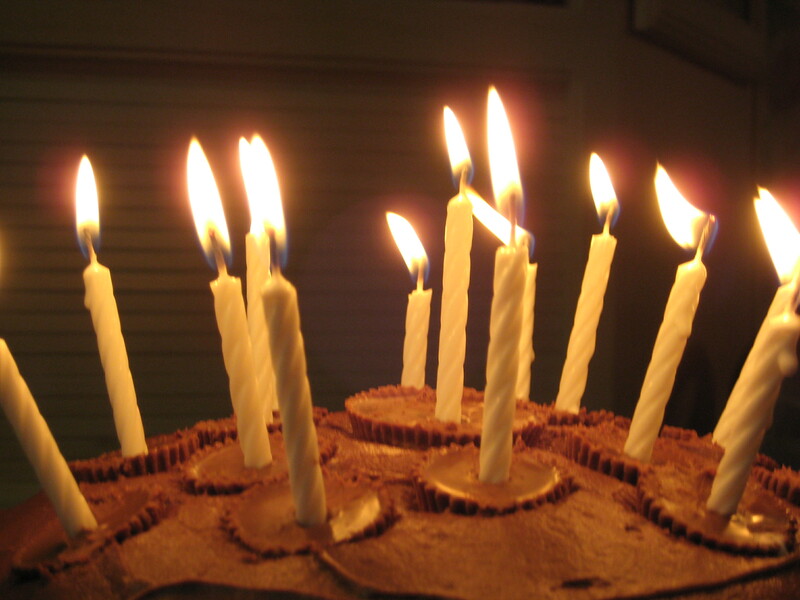 So, depending on which anniversary is being counted, the numbers are 34 or 30, but it is always both for us. Arslocii. This particular advantageous connection is the underpinning for much love, oodles of discussion and experience, a few disagreements and some creative output. However, this placeness relationship is slightly out of the ordinary: not just art and site, but heart and sight. We just hope it lasts, since there is way more to be discovered and learned, and we were dumb as mud when we commenced this journey. Luckily, we still find placeness in each other, together. Back in the early days of the Web, its biggest selling point (in a giant cloud of delectable intellectual seductions and complete boneheaded and hedonistic time-wasters) was its capacity to provide news and opinion, and updates of same, in words and pictures (later, of the moving kind), instantly, constantly. For an information junkie, it was the mother lode of resources, on-demand updatedness, and enough headline skimming for one to absorb and then project the appearance of knowingness. It was great fun, bouncing from story to story, site to site, seeing more, gaining aspects, having a panoply of voices informing (and misinforming) one’s own. But, then, with all this news available, people started to do a strange thing: limiting their scope. Through the use of aggregator algorithms, readers were able to shut out all news except those they specified: You could tell the program or site that all you wanted to see was, say, business news, or sports news, and what was provided for you was just that and nothing more. And that ability to determine line of sight when it came to being informed, that specialization, changed everything: it changed how knowledgeable we were as a people (less broadly so); it changed our view of the world (more narrowly so); and it began the end of newspapers, which could not personally aggregate and segregate focused news for each individual reader. And, for a news junkie, that was the shocker: Why would you want to know less – that is, more about a few things but less about everything else? Why filter out the greater world? The paradigm of newspaper reading was that of a journey, through space and time; one in which you followed paths to destinations that you wanted to get to (jumping from Page One to Page 12, for instance), but by doing so it became one in which you also bumped into things you didn’t know you might, fascinating, illuminating, even life-changing things. That little story on Page 12, at the bottom, was likely the one you remembered all day and told people about at the water cooler. In what is described as our hectic world and hurly-burly lives, we feel the need to shave off precious seconds of wasted time by cutting to the chase – bypassing the rose and coffee smells – and by doing so what we have lost is chance and the lucky accident … serendipity, or, perhaps, fate. And by the way we use the Internet for our news instead of the locational, processual, processional walk through a newspaper, the placeness of it all is gone, too, as well as the art of mastering the maneuvering through and understanding of that placeness. We get information, but, somehow, we haven’t earned it. Getting to specifics is our one goal – everything else is just the fly-over. And so it is, in terms of placeness, ironically, in the way we now figure out our travel plans. The journey has been removed from map reading, and the placeness has been excised from the finding. 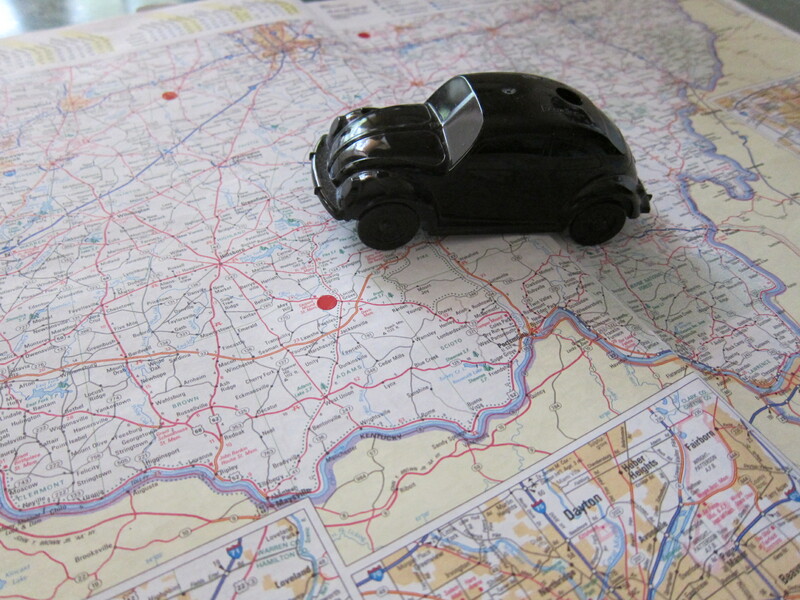 We here at arslocii have been trying, the past few days, to plot out a car trip of several hundreds of miles, across a half-dozen states, in little more than a handful of days. One of us – the one most intoxicated by the Internet (okay, okay, that would be the male version of the animal) – is charting the course using Google Maps, a generally excellent service combining fine mapping with the kind of GPS-ish, turn-here-then-there directions once limited to MapQuest. 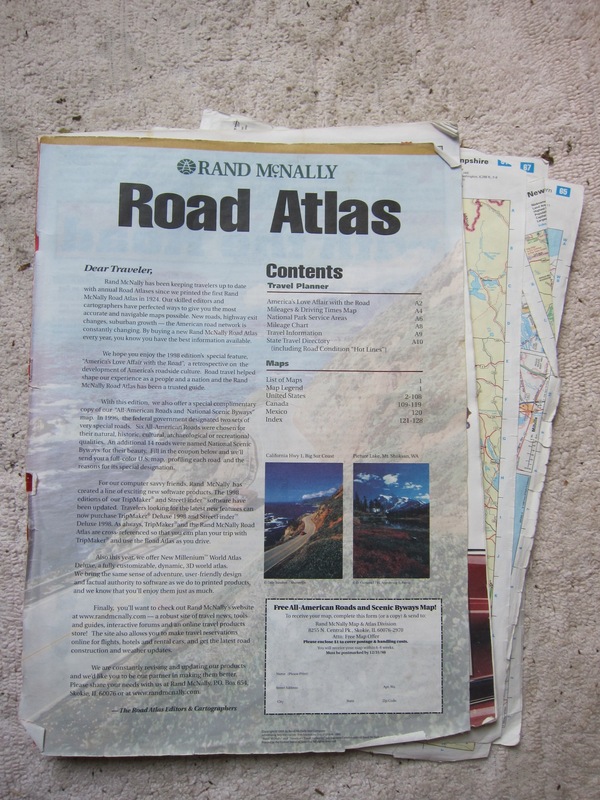 The other of us is doing it the old-fashion way: the several years’ old Rand McNally road atlas. (Do they actually make them new, or do they all roll off the presses somehow old?) Actually, it’s copyright 1998. Google is as current as … well, more current than 1998. 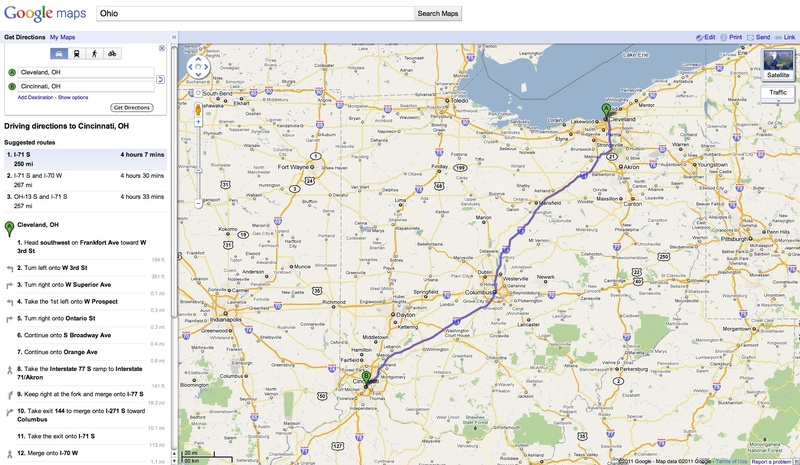 Using Google Maps, one is speedily propelled to desired locations, and distances between these desired locations are instantaneously calculated. The program seems to understand, a bit eerily, where you might be headed based on where you’re starting from: as you type in the first few letters of your next stop, a drop-down menu suggests possibilities and, almost invariably, the first option offered is the one you were looking for. Impressive and ingenious, there is a sureness about it, a feeling of authority – with a speed that is winning. It’s not quite magical, but it is quite remarkable. And fun – like an arcade game, but with a point. And yet … there’s something wrong there. Although Google Maps finds the town you want with all due haste, it is like the news aggregating programs: key spots, and all the rest is fly-over. 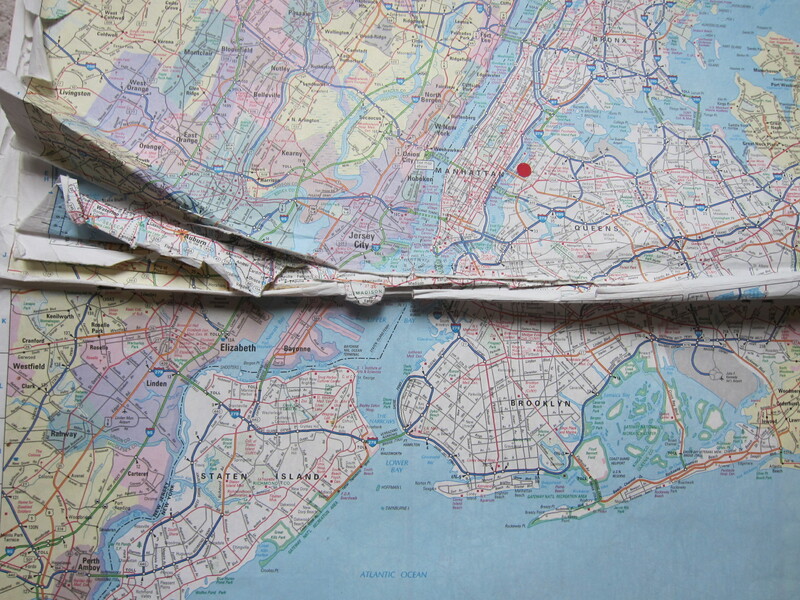 Plus, the paradigm of travel is obliterated: using the book-form atlas, one is compelled to search – to “travel” – to find one’s way through the pages and what is on each page. The user, goes to an index at the back of the book, runs his eyes down a long, small-type list of towns and cities – already we’re traveling – finds the locale he wants and notes that on the map on Page 18 he can find his destination at something designated as “E-16.” Flip pages to get to the proper map, find the number 16 along the bottom of the page, place your finger on it and proceed to slip that finger vertically until it reaches the horizontal E axis, and then search within the defined rectangular area, filled with names and dots and red and yellow road lines, for the site you seek – all the while “traveling” through hamlets you’ve never heard of and burghs with odd or storied names, over blue creeks and through green state parks and by historical markers, actually touching them, all on your path to the name and dot that you want. Processual, processional, a simulacrum of real travel, the chance of seeing something you didn’t know was there. Serendipity. Placeness. Art. Slower? Sure. Less elegant? Certainly. More “human”? Definitely. And more paradigm shattering: When you type in a town name into Google Map’s search, you are taken right to it, and have to move outward from it to find out where you are – to determine the context. 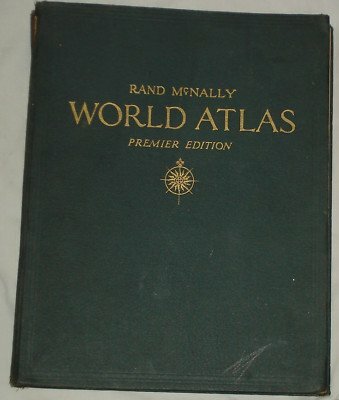 With the Rand McNally, you start away from the goal and slowly move in its direction … just like real traveling, going from the general to the specific, from a loose set of parameters to a point. Traveling, especially by car, is a pilgrimage of personal discovery in which the road experience is as pertinent as the arrival at Mecca. So is the planning portion: “Here’s where I start, here’s where I end up … and look at all that stuff we’ll pass through in-between.” All that stuff is what makes it all worthwhile. As in geometry, a line is a series of points. So is traveling, and travel planning (and, don’t get me started, life itself): not a “Star Trek” beaming up, but a going towards, place by place by place.